through Turtle Mountain Mythic Art. As we continued our talking circles and shamanic scanning, it became clear that one of the women in our circle was experiencing a secondary level of shamanic initiation, and that the imagery she was seeing in dreams and shamanic journeys was trying to make her aware of that fact. When we put our feet on a genuine shamanic path, answering a call resulting from a physical or psychological trauma of such magnitude that we have experienced a shamanic “ego-death,” we cannot know where that path will lead us. Shamanic ego death occurs when one is stripped of one’s previous ego-identity as a result of the intensity of the psychological or physical trauma one suffers during one’s initiatory trial and calling. Shamanic ego-death is a requirement for receiving a shamanic calling, and is one of the hallmarks of a genuine shamanic initiatory crisis, leading us into deep introspection and humility about who we once were but are no longer. It is this aspect of the initiatory crisis that makes one psychologically “fit” to ethically handle shamanic power, for there is no room for ego-responses or emotional reactions to others when doing this kind of healing work. Nor do we usually know, unless we have an experienced shamanic teacher to guide us along our shamanic path, that we will be facing additional initiation trials as we grow in shamanic understanding and strength. Each new level of shamanic understanding and strength we achieve must replace its predecessor, which is no longer appropriate for us. While the initial crisis is usually quite dramatic and ego-shattering, the additional levels of initiation that may follow are not always so. In preparation for the deeper level of shamanic consciousness that awaits us in such instances, we may experience a slow breaking down of ego and shamanic identity over time. 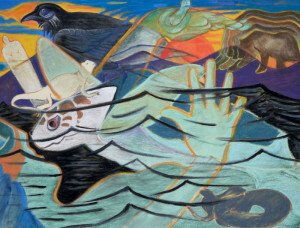 Many of these secondary initiation trials become teachers of shamanic endurance and tests of shamanic commitment rather than of finding the will to survive and embrace the sudden “cracking open” of shamanic consciousness that one generally experiences in the original shamanic initiatory crisis. If we are shamanically alert, we may become aware of this gradual erosion of identity by means of dream or shamanic journey imagery, or by means of experiences in physical reality. These additional trials of shamanic endurance come to us, not because we seek them; those of us who have gone through the trauma of a genuine initiatory crisis know better than to actively seek shamanic power. The way of it is that shamanic power approaches and calls us when it will, and only when we have, usually all unawares, achieved a level of shamanic consciousness to which it is attracted. 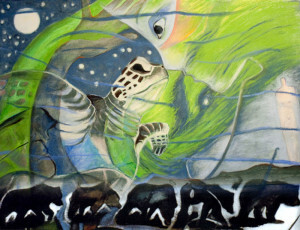 As we looked into the situation, we received new teachings from Sea Turtle, perhaps the most important of which was that shamanic archetypes such as Sea Turtle live and die as do all living beings in physical reality, reincarnating in new forms appropriate to individual shamans and to the times in which they live and work. When one is going through such a secondary initiation, one may feel detached or somehow distant from one’s personal and shamanic identities for a time, until the old identity-perception has dissolved and the new one has taken form as the process of moving into the new level of shamanic consciousness completes itself. It’s critical that the initiate discipline herself to psychologically tolerate this feeling, and to cultivate a shamanically implacable and intentful confidence that the process will successfully complete itself. The test of this particular kind of secondary initiation is to find the shamanic ability to endure the discomfort of letting go of the familiar and simply allowing the new to find its shape and form within one’s psyche. This teaching can be a tough one for us Westerners, who are so enmeshed in patriarchal cultural values, and have been taught from childhood that action, not waiting or enduring uncertainty, is the best way to deal with any and all dilemmas. Sea Turtle Medicine, with its enormous capacity for creating and holding psychological and shamanic balance, and for patience and endurance, is the perfect medicine to help us through not only times involving secondary shamanic initiatory experiences, but also times of uncertainty and loss of ego-identity that any of us may experiences as we love, lose love, marry, divorce, become parents, or make geographical moves or career changes. For more teachings about Sea Turtle Medicine and holding one’s “center” in times of stress, refer to The Center teachings offered in my new booklet, Shamanic First Aid for Today’s Woman.